Nicholas Galanin strives to create fearlessly. The Tlingit-Unangax artist works in multiple mediums and from his home in Sitka, has made a name for himself in the indigenous art world. At 39, Galanin just finished a solo retrospective at the Heard Museum in Phoenix, Arizona. “Dear Listener” is the largest exhibit by a contemporary artist at the Heard Museum in a decade. 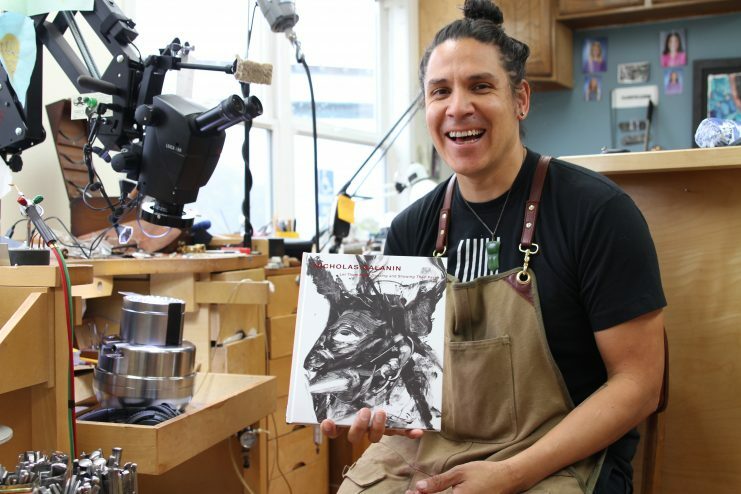 At his workshop in Sitka, all of Galanin’s attention is on a thin and shining piece of silver. 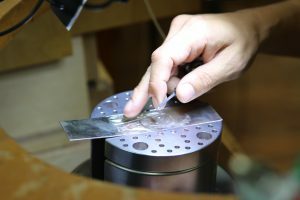 “I am working on some silver jewelry right now, so this is an engraving and it’s going to be a bracelet when it’s done,” Gallanin said. Rubbing oil based clay on the silver, Galanin sketches a small circle. He brings a pneumatic hand engraver to the metal, moving slowly. Jewelry is where Galanin got his start. At 14, he began carving under the apprenticeship under his father, Dave Galanin. Pretty soon, the newly born eye of a Raven looks back at us. Galanin used to design everything on paper and transfer the image to the silver. Now, he trusts his line work and creates freely. His last desk job was at 18-years-old at Sitka National Historical Park, greeting visitors. “Nobody was there [one day] and I didn’t have anything to do, so I drew. I was told that I can’t do Tlingit art drawing there. I could only read Russian history books. So I quit. That was my last job that was non-creative related,” Galanin recalled. Galanin’s made a living from his art ever since, earning national and international recognition. Singer Erykah Badu is wearing his silver work in her latest Instagram photo. Galanin is a musician too, releasing an album last year with his band Indian Agent. 2018 has been a busy year for Galanin, but a lifetime in the making. In addition to the solo retrospective at the Heard Museum, Galanin’s released a 140-page monograph called Let Them Enter Dancing and Showing Their Faces and led the carving of a totem pole. Galanin and his five apprentice carvers hit their mark. The 40-foot healing pole was raised in June to memorialize when the City of Douglas burned down the Douglas Indian Village in 1962. 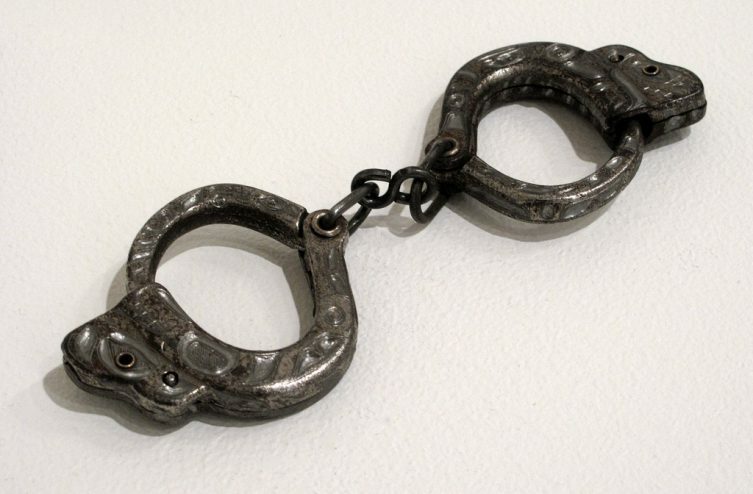 Take for example a pair of iron handcuffs, intricately engraved by Galanin with Tlingit imagery. He calls the work, “Indian Children’s Bracelet,” in reference to the separation of families through Native American boarding schools. “That’s representation of that selective amnesia. Somebody will look at these children’s bracelets. If they just want to look at the surface, they’ll see the engraving and they’ll see the Tlingit art from that they might appreciate. They will not see the full object or the history that that object tells,” Galanin explained. That’s one of 50 such works in the exhibit. Galanin flips through his monograph, pointing out others. There’s “God Complex,” police riot gear made out of porcelain. “White Noise, American Prayer Rug” evokes the fuzz on a television screen. “We Dreamt Deaf” is a taxidermied polar bear from Shishmaref. His unstuffed hindquarters appear to melt. It’s a provocative statement about climate change. “They offer room for dialogue and progress. They’re tools. The work is doing the work,” Galanin said. “Indian Children’s Bracelet” is made from hand-engraved iron, one in a set of three. The other two are in permanent collection at the Portland Museum and the Alaska State Museum. The three bracelets are never to be reunited to emphasize the separation of Native American families. Viewers have reacted all kinds of way, he tells me, some saying the work made them uncomfortable. Opening night was particularly overwhelming. The group Shabazz Palaces were performing and Galanin was getting approached on all sides. “It was like I walked into a pit of piranhas at the opening and was being fed upon by docents, white old ladies. They were vicious. They were like demanding me to explain the work and myself and these titles and all these things,” he says. Other viewers, especially Native viewers, said the work made them feel seen and empowered. He reads his favorite comments from Instagram. 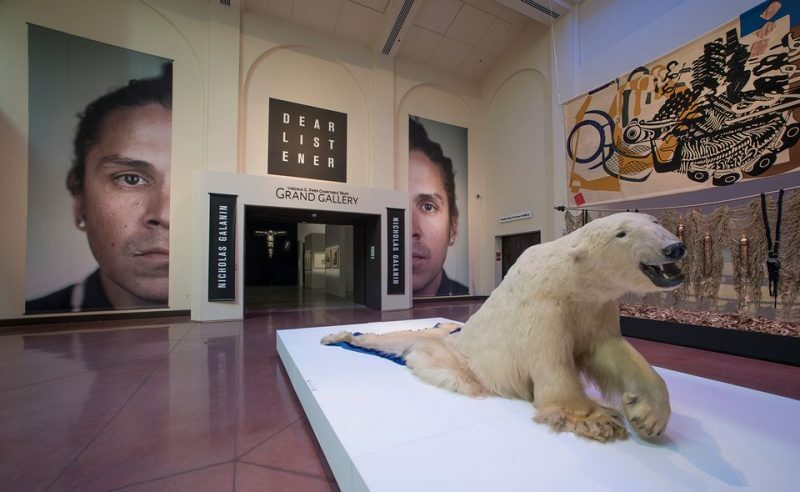 “‘I finally got the family to see the brilliant Dear Listener at the Heard Museum. This experience has forever changed my spirit,’” Galanin reads, grinning. “Dear Listener” is the name of the exhibit and Galanin’s fully aware some of his most attentive listeners are his three children. They’ve seen the home studio in Sitka grow over the years. “Forever holding new things and new objects. Every object is a conversation. These conversations we’re having now, I have with them,” Galanin said. That is the most important part for Galanin — not the art in the exhibit, but the conversation that comes out of those willing to take the time, look, and listen.